The VSP Surgical Instrument Kit includes a perfect selection of surgical instruments just right when working with very small, delicate tissue. All of the instruments are made of high-quality, stainless steel and are useful for procedures on birds, reptiles and small mammals. 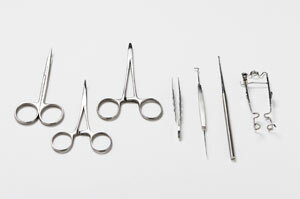 VSP Surgical Instrument Kit includes: two-over-one forceps, small needle holder, small abdominal retractor, cere/nostril curette, 3-1/2" mosquito hemostat, iris scissors,VSP tissue elevator/retractor. The combination of these surgical instruments is a VSP exclusive.